I read this famous novel in college, 20+ years ago (yikes!) and finally picked it up again recently. My reading is going rather slowly, I admit, mostly at lunch while at work and on the bus to and from work, but, wow! What a disgusting story, even at the start. I know "disgusting" is not a great word but as I started reading it, that was the first thought that came to mind. I knew what the story was about and why it was so controversial, but I guess I had forgotten the specifics. On one hand, I can understand why I would forget such details due to time mainly, but I'm kind of sad that I had not remembered more of it. I guess reading it in college, with many other such assignments and a less mature than now (hopefully :) ) mind probably provides a reasonable explanation, but I do wish I had remembered more about this story. It is very good reading, even when I struggle through the dialects in which Mrs. Stowe wrote many of the conversations and I am happy to have started reading it again. 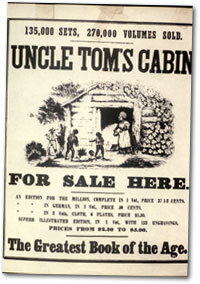 It is a powerful story of slavery and many of the different types of characters involved in it. That it is based in Kentucky and obviously concerns the northern Kentucky and Cincinnati areas does make it a bit more personal to me, especially as I ride a bus across the Taylor-Southgate Bridge that spans the Ohio River, one of the major boundaries between potential freedom and slavery in the mid 1800s and in this story. I hope I can convince myself to read it more frequently and focus on this story, but I also want to think about what I'm reading and not just glance over words on a page. I know it is a novel and is fiction, but slavery was a real part of this country, this state, this region and even my family. Families were split up, people were hurt and millions of African-Americans were treated like cattle or pieces of furniture or other such property. This story is re-opening my eyes to one period view of that institution and its affects on so many people no matter how young, old or innocent. I imagine I'll have at least one or two more entries about this book as I get deeper into it and ponder the issues it raises and the stories it tells.